Garibaldi Park, named after its towering 2,678-metre peak, Mount Garibaldi, was designated as a provincial park in 1927. In honour of the 19th century Italian patriot, Giuseppe Garibaldi, the park is known for its natural beauty and its endless hiking opportunities. Garibaldi park’s rich geological history, diverse vegetation, snow-capped mountain, iridescent waters, abundant wildlife and scenic vistas all contribute to the immense beauty. The park is located in the heart of the Coast Mountains just 70 kms north of Vancouver. Offering over 90 kms of established hiking trails, Garibaldi park is a favourite year round destination for outdoor enthusiasts. Looking for the above map as a print-ready letter-size PDF? 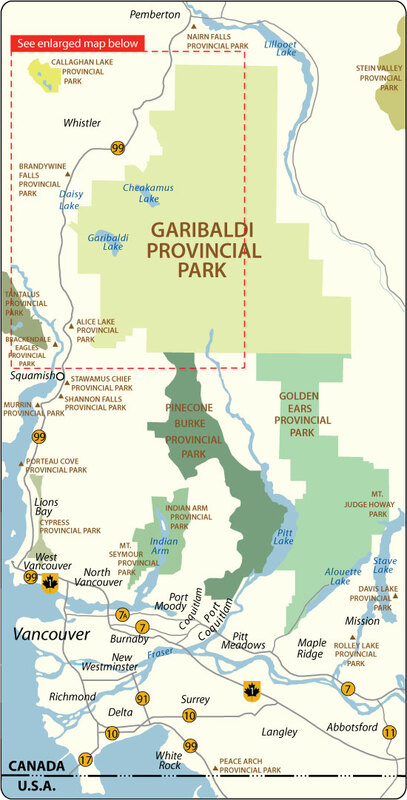 Looking for an enlarged interactive, zoomable map of Garibaldi Provincial Park with surrounding provincial parks on its west side? We’ve got that too! 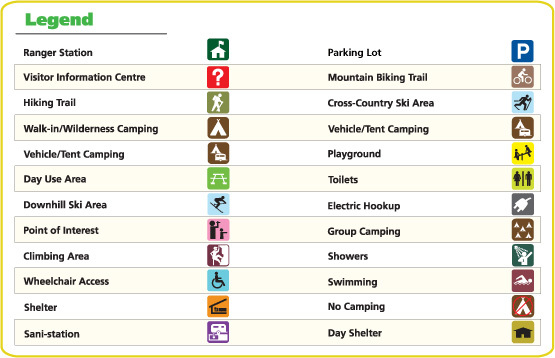 To go directly to a provincial park, you can use the “Quick Find” feature. It will also display a photo of the park and some text at the bottom. You can also click on the photo thumbnail to enlarge it. Clicking back will close it. You can close this window by clicking the small pop-up window cross. Clicking the left-pointing arrow by the “Quick Find” will get this feature out of your view. We used BC Parks maps as ground work base for the maps you can see on this page. Please keep in mind we’ve re-purposed them for this Website. We hope you’ll find them useful when preparing your outing and we encourage you to visit the BC Parks Website for detailed information. British Explorer Captain George Vancouver reached Howe Sound in June 1792 and became the first European to see the mountain. During this time George Vancouver met and traded with the local natives in the area. In 1860, while carrying out a survey of Howe Sound on board the Royal Navy survey ship HMS Plumper, Captain George Henry Richards was impressed by a gigantic mountain dominating the view to the northeast. Captain Richards, and his officers, re-named the mountain after the Italian military and political leader Giuseppe Garibaldi, who that year had succeeded in unifying Italy by patriating Sicily and Naples. In August 1907, the Vancouver mountaineers A. Dalton, W. Dalton, A. King, T. Pattison, J.J. Trorey, and G. Warren reached the summit of Mount Garibaldi. The views from the peak inspired the establishment of summer climbing camps at Garibaldi Lake. This early interest led to the creation in 1920 of a park reserve. 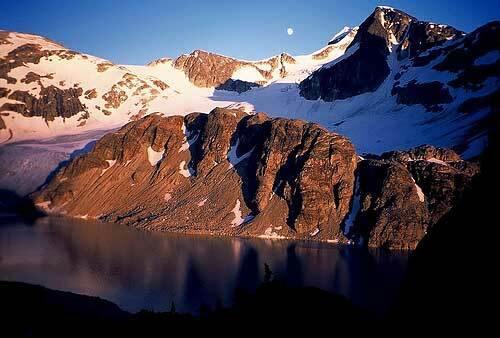 In 1927, Garibaldi was made into a large wilderness park called Garibaldi Provincial Park. Named after Mount Garibaldi, this 1,946.5 square-kilometre park was established to protect the rich geological history, diverse vegetation, iridescent waters, abundant wildlife, and rugged mountains, many of which are capped by glaciers. When skiing caught on in the 1940s, Vancouver skiers began to search the glaciers and rugged mountains within the park. Early skiing was limited to the more easily reached area around Garibaldi Lake. In the winter of 1944, a club group completed the first possible ski of Mount Garibaldi. The famous mountaineers Don and Phyllis Munday (see our story on Phyllis Munday) completed lots of tracks additionally. In the 1944-45 Canadian Alpine Journal, the Mundays reported a ski attempt on Mount Garibaldi with Phil Brook, who was a friend of the Mundays. They skied on Sphinx Glacier and scrabbled Panorama Ridge just north of Garibaldi Lake during the same trip. Most importantly, during this period a road was built on Paul Ridge near the small community of Squamish at the north end of Howe Sound, therefore granted better vehicle approach to the highlands near Mount Garibaldi. 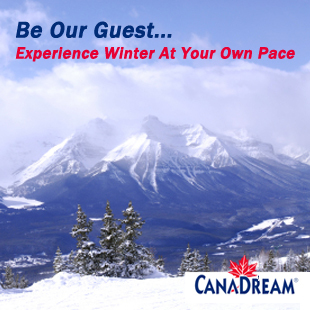 With easier access Vancouver skiers spent even more time on the glaciers of Mount Garibaldi. The result of this was the formation in the 1940s of the Garibaldi Névé Traverse, an overnight adventure that (weather permitting) can include a fine descent of Mount Garibaldi.